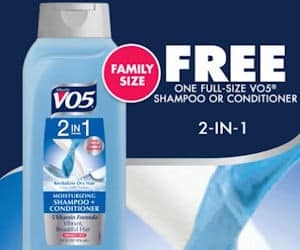 HURRY-Get Your FREE Full Sized VO5 Shampoo While Supplies Last! You are here: Home / beauty / HURRY-Get Your FREE Full Sized VO5 Shampoo While Supplies Last! Right now, you may be able to get a FREE full sized bottle of V05 shampoo or conditioner. To try to get your freebie, you have to click on the link on the VO5 Facebook page. After you have completed that step, select users will receive a special coupon for a FREE full sized bottle of the brand new Alberto VO5 shampoo or conditioner. Redeem your coupon in any store that sells VO5 hair care products. This is an incredibly HOT offer that will definitely not stick around for very long. Try to get your awesome freebie while this offer is still valid!